Goldfish Swim School locations across the country will be celebrating Water Safety Day on Saturday, May 19, 2018 and everyone in the community is welcome to stop by their pools for a special event. 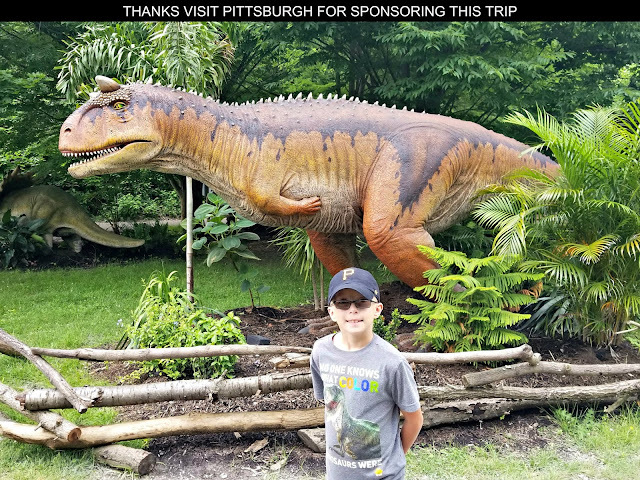 While water safety is a topic the swim school takes very serious and focusses on throughout the year with its students and their families, this one day event is a great way to reinforce these important messages in a fun way. Stop by to check out a presentation about being safe in the water with Bubbles, Goldfish's mascot, as well as take in some safety demonstrations and drills in the pool led by swim school instructors and lifeguards. Plus there will be fun activities and games to participate in as well. Water Safety Day events are open to the public and FREE to attend. Your family doesn't have to be Goldfish Swim School members to participate in this golden experience. The Goldfish Swim School facility that my kids are enrolled at has a lot of fun festivities planned for May 20th. You have your choice of jumping in their indoor pool or some outdoor bounce houses during their Water Safety Day festivities. Complimentary beverages, hotdogs and snacks will be given out from a food truck in their parking lot as well. Plus my daughter's favorite part of last year's event will be returning again ... an incredibly talented balloon artist who will be providing kids with some wonderful souvenirs to take home with them. Plus there will be lots of other things to do that you'll have to stop by to find out about. Did I mention this is all FREE for parents and children who stop by whether or not you are taking lessons at the swim school?! Contact your local Goldfish Swim School for specific details about what specific locations have planned for Water Safety Day as well as the hours when their activities will take place. 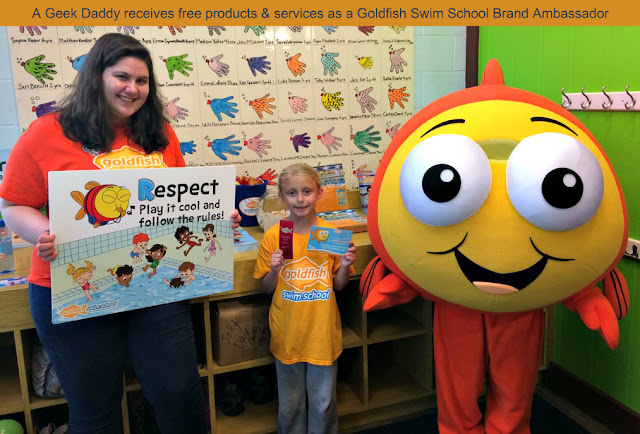 Find a location near you by visiting goldfishswimschool.com. 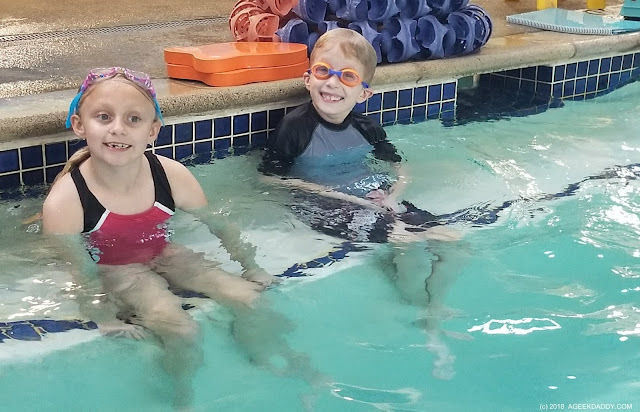 There are Goldfish Swim Schools across the USA in Colorado, Connecticut, Florida, Georgia, Indiana, Illinois, Kansas, Maryland, Massachusetts, Michigan, Minnesota, North Carolina, New Jersey, New York, Ohio, Oklahoma, Pennsylvania, Texas, Utah, Virginia, Washington, and Wisconsin; as well as in Ontario Canada. Keep it Fresh: When the weather warms up families start spending more time in and around water. As summer approaches make sure to go over water safety rules and practice with children what to do in an emergency. Use your own behavior in and around water as a model for kids to follow. They are more likely to pick up on how to stay safe around water by following your example. Pool Rules: If you are going to be spending a lot of time around pools it is always a good idea to have some hard-and-fast rules for your family. No running. No diving in head first. Depending on the ages of your kids, you might require a lifejacket, or have a “no going in the deep end” rule. It’s also a good idea to have built-in breaks. Swimming is tiring and you can get dehydrated or fatigued without really realizing it. Taking a 15-minute break each hour to drink some water and chill is a great rule to make your own this summer! Never Swim Alone: This is a rule that should NEVER be broken, no matter where you go or how old you are. Even the strongest swimmers can cramp up or have a medical emergency. Don’t enter the water anywhere, for any reason, alone. No surfing at the ocean, kayaking on the lake or doing laps at the hotel pool by yourself. Get CPR Certified: Even families with the best laid plans can find themselves in an emergency situation. Being prepared – and trained – for an emergency is one of the best water safety tips out there. Have someone in your family become CPR certified (with rescue breathing) or maybe do it together as a group activity. It’s a relatively quick and easy class and it’s offered by community centers and other local groups. It could save a life. Always Pay Attention: There could be a hundred adults around a pool party but if no one is paying attention to what is going on in the water it really doesn't matter how many people are there. Sometimes, even a few minutes of inattention can be deadly in and around water. When water is around, there should always be a few dedicated “water watchers” whose sole job is to keep an eye on the swimmers. Vigilance is key. No chatting, no checking your phone. Watch the water and those in it. Lessons Learned: One of the best ways to keep kids safer in and around water is to teach them to respect it. One of the best ways to do that is to enroll them in swim lessons. The confidence and skills they’ll learn are invaluable. Being enrolled at Goldfish Swim School has been a wonderful experience for our family. Both my son and daughter have really excelled in developing their swimming skills through the lessons they've taken there. But in addition to mastering swimming strokes, they've also learned how to remain calm and handle problems that could endanger them while in or around the water. 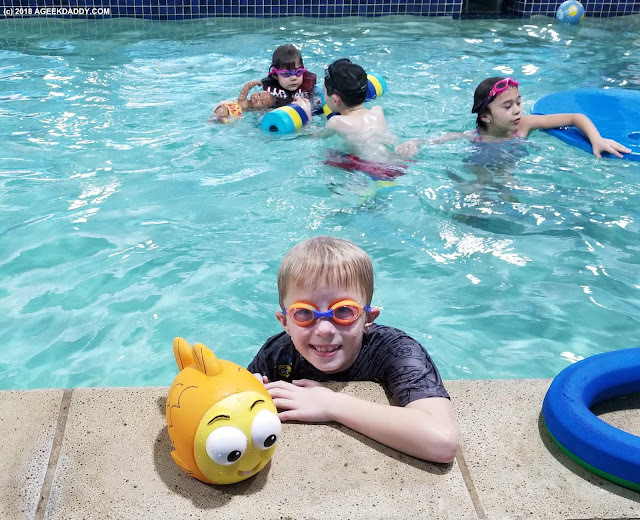 In fact, last summer when my son got in an over his head situation while at a water park that could have quickly become dangerous, he used the water safety tips he had worked on during lessons at Goldfish Swim School to keep his cool. He didn't panic, treaded water, looked for the closest point to get out of the water, and got the attention of a lifeguard to help him. You can read more about how Goldfish Swim School saved the day in this past ageekdaddy.com blog post. We've attended Water Safety Day at our local Goldfish Swim School the last several years and always had a great time. As a parent, I appreciate fun family activities like this that are both entertaining and educational. 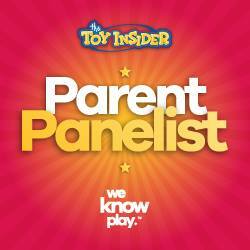 This event absolutely gets A Geek Daddy nod of approval!